Argentiina Tango algkursus õpetajaga Argentiinast - Hernán Ohaco. Kui oled kunagi mõelnud salsaoskuse kõrvale ka Argentiina Tangot õppida, siis NÜÜD ON ÕIGE AEG! Tango kursus Casa de Bailes alustab 7. oktoobril. Kolmapäeva õhtud kell 20:00-21:30 broneeri 1,5 h kestva tangotunni jaoks. Classes start at 20:00, end at 21:30. During the beginners course we will work on the embrace, elegance, musicality and finally, figures that can be use for social dancing. Also in every class we will consider some aspects as a general priority. Awareness of axis and own balance. Perception of shared point of balance. Ability to sustain a posture while dancing. In women: to hear the message of the man and generate answers and alternative answers. In men: develop maximum delicacy and clarity of his "lead." In both: awareness of the movement for freedom of expression in dancing embrace. 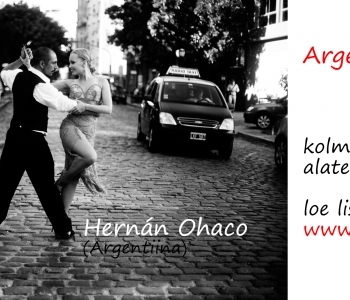 Since Hernán comes from Argentina, tango was always present in his life in different forms, but he started to focus more closely in the art of tango as a dance in 2008, . Hernán has a holistic relation to tango; his aim is to give partners and communities new experiences, helping them to learn and enjoy Tango with the whole spectrum. Having a Bachelor’s degree in Education and background as an army instructor, it is natural for Hernán to teach. He has taken lessons with various maestros, and enjoys constantly learning and developing his dance. Besides teaching, he likes to perform and express himself as a creative creature. His dance style varies depending of the environment, if we study closely there is 5 types of Tango concepts that although they are a bit different still they act as fingers that belong to one hand. Tango Escenario (show), Tango Salón, Academic Tango, Social Tango (milonguero) and Nuevo Tango. Hernan works with all the styles always aiming to construct ways that will make your dance personal and natural.